Manchester City star Raheem Sterling has just deleted a tweet with a cheeky transfer message to Borussia Dortmund winger Jadon Sancho. 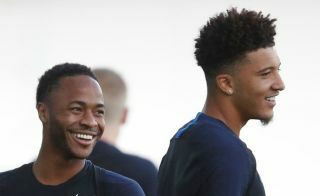 The pair are together on England international duty, but of course they will also know each other from Sancho’s time at City earlier in his career. The 18-year-old has since become a big hit with Dortmund after gambling on a move to Germany to ensure he played more often – a gamble that has more than paid off. This has seen the Independent recently link him as an £80million transfer target for Manchester United this summer, though Sterling has teased him about a possible return to City. The tweet is now gone. Make of that what you will!